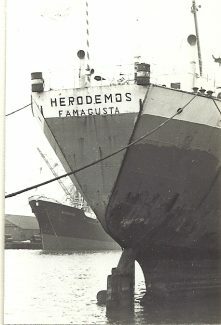 The very old vessel HEPODEMOS registered in Famagusta. I have no more information on her. Can anyone add details? This vessel was actually named HERODEMOS. Looks like the painter got it wrong at first and the stroke of the R was crudely painted on the P afterwards. Very interesting photos, JW, and of a ship that was no stranger to Tilbury Dock. In fact during 1947-63, she made nearly 40 visits to Tilbury … under different, but very familiar, names. 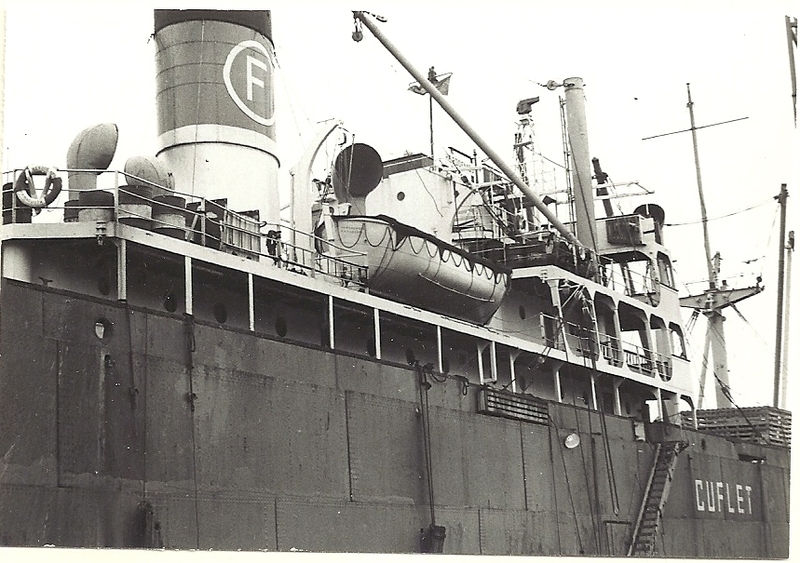 This 5107-tons gross steamer started its seagoing life when delivered by a shipyard in Sunderland in July 1947. Its first name was LAGOSIAN, owned by United Africa Co Ltd, an offshoot of Lever Brothers, and destined to spend the next 15 years in the West Africa trade. 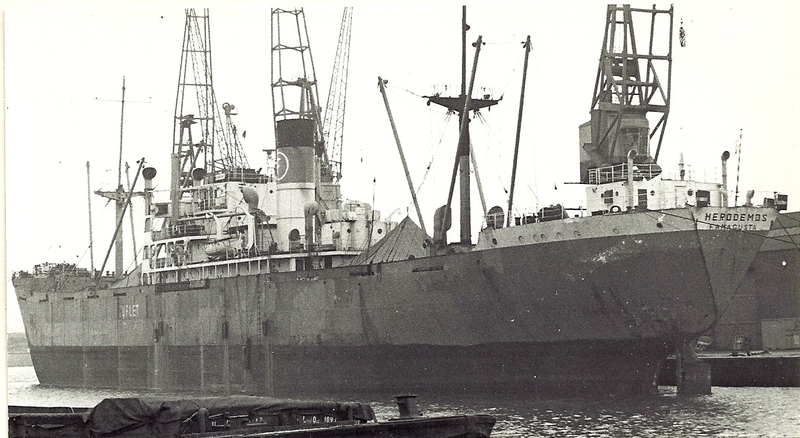 It did not make its first voyage from Tilbury, but its second voyage as LAGOSIAN was from here with a full general cargo for West Africa – it left on 8 November 1947. The following year it was transferred to United Africa’s newly-formed subsidiary Palm Line Ltd and was renamed LAGOS PALM. The ship kept this name until 1960 (when it was needed for a new LAGOS PALM) and it was renamed OGUTA PALM. 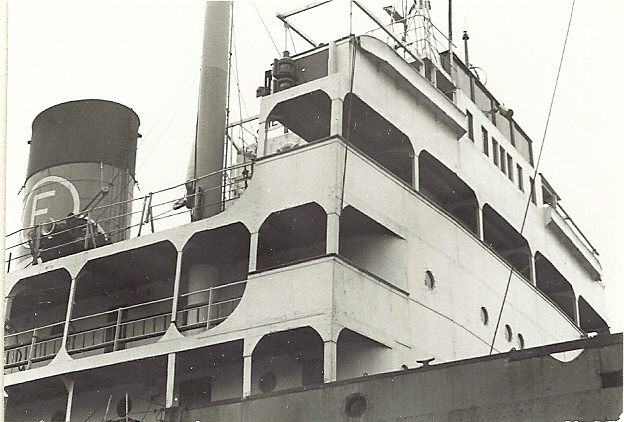 In 1964, when Palm Line was having a bit of a shake-up, the ship was sold to a Greek outfit and renamed HERACLITOS; sold again in 1969 it was renamed HERADEMOS, owned by Helean Navigation Co Ltd, of Nicosia, Cyprus, and registered in Famagusta. The guy behind it was one George Eleftheriou, who did his business from an office in Piraeus, Greece. 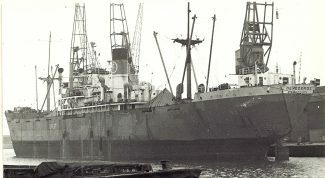 It seems that it made just one visit to Tilbury as HERODEMOS and left with a small cargo on 9 January 1970 for Cienfuegos, where, after discharge, it loaded sugar for Santander. Its interesting to see that on the hull is painted CUFLET, which was a Cuba-related agency involved with the export of sugar. Within a year HERODEMOS was laid up in Greece and did not move again until it went to breakers in Yugoslavia in 1973.